When it comes to data center modernization, companies are struggling to make decisions about infrastructure and services to be more competitive and agile, reduce costs, and minimize risk. As trends such as virtualization, data center modernization, and software-defined everything take hold, it’s imperative to understand the new approaches to data center infrastructure and data architecture that drive the efficiencies required by customers. Hewlett Packard Enterprise offers a revolutionary and disruptive hyperconverged solution designed to simplify and deliver big savings in capital and operational costs. 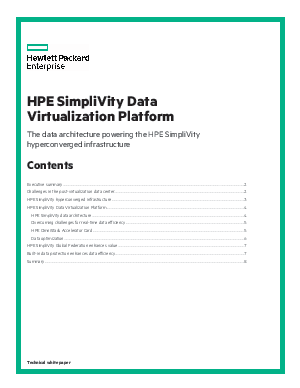 This paper will examine this transformational data center infrastructure and data architecture—HPE and its HPE SimpliVity Data Virtualization Platform.